With Ubuntu 16.04 nearing release, I decided it was time for a second VPS. Every so often I take a look at my current VPS and see whether there is a cheaper (and better) one available from my provider, as well as looking at alternative providers. As I am mostly satisfied with my current provider, xenvz.co.uk/OpenITC, the obvious question is whether any of DireVPS's packages would be suitable for me and at a price point less than I'm currently paying. John Cook, VPS Hosting Change in 2015? They were, and I transitioned to DireVPS. My XenVZ package is still listed in OpenITC as the disk and IP add-ons (SLA compensation) have yet to expire, not that they can be used for anything. Anyway, for a long time I have been thinking about resiliency which is part of the reason why I started moving my backup DNS from Hurricane Electric to Esgob. Esgob does, however, still have issues with new domains not getting pushed to all of the anycast instances. Combined with Hurricane Electric DNS's failure I wondered if I could get a second VPS and completely manage my own DNS. I have also been thinking about my Web sites and other services. A specific challenge I want to investigate is a round-robin Web server configuration that supports TLS (including session resumption). As is the case when I look around for what the best deals are, I went to Low End Box (LEB). After a month or so I decided to give the LoveServers KVM Offer [LowEndBox.com] a try. With the offer, I now have an annually billed VPS costing £15.00 per year (half the cost of my current DireVPS VPS). Your service will be suspended if it receives and or sends any DDoS attack. Service activation or termination after the suspension will be in our sole discretion. LoveServers does not guarantee that any IP address space will be globally accessible due to factors out of our control. The parties expressly recognize that it is impossible to maintain flawless security, therefore the customer is solely responsible for properly securing their hosting service provided by LoveServers including changing initial passwords and making any security adjustments and patches over time. LoveServers is not responsible for the cancellation of PayPal subscriptions following the cancellation of a service contract. This is an action that must be carried out by the customer after the service cancellation has been confirmed. Failure to do so may result in additional payments being taken. LoveServers will suspend services after 2 days of non-payment. After 7 days of non-payment, services will be terminated along with all data, IP addresses and other information. Repeated failure to pay invoices with termination will lead to account termination and refusal of service. Banned services is a rather specific list (some of the terms used almost certainly have the same definition as the Wikipedia articles). Anonymizer, for example, is defined as an intermediary and privacy shield between a client computer and the rest of the Internet. Although that definition includes VPNs and TOR, the bullet point near the bottom makes it appear that what they really have a problem with is anonymizers as a service, rather than anonymisers in general. CJDNS is probably OK between vps4 and vps3/home, but connecting to Hyperboria is probably a no-no unless using Tor as a non-exit node is OK (i.e. darknet nodes OK as long as they don't allow other users on the darknet to go back out to the regular Internet). Looking at the last few items in general (and the DDoS termination policy) it looks like the main concern is resource usage. Encoding videos and Bitcoin mining is CPU intensive, whilst video streaming and DDoS attacks are bandwidth intensive. Everything else is either illegal, a type of fraud, computer misuse, or a legally grey area due to dual use (e.g. IP Scanners). When it comes to dual use "hacking" tools, it is probably best to seek permission before using them (like when I asked OpenITC if it is OK to port scan my own VPS from outside their network). That just leaves the legal unknowns. Linking to pirated content might not be illegal/unlawful, or it might be. Link generator scripts appear to be somewhat akin to a server-side script that can visit a given cyberlocker URL and extract a direct download link for the file at that URL. Assuming deep linking and file lockers isn't the issue, this again looks like a copyright "murky law" issue. DDoS-prone applications is unclear. Booters, on the other hand, are (from the look of YouTube) things like High Orbit Ion Canon. Flood scripts also launch DDoS attacks at a target. Is "or" used as in "cats or dogs" or as in "felines or cats"? If the former, DDoS-prone must mean juicy targets for DDoS attacks. So, DNS, Web, IRC, pretty much everything. I therefore believe that this is one of those extremely broad terms/conditions that lets a company terminate any customer's account/service. It doesn't matter if I'm below my bandwidth allowance, I'm hosting a Web site that gets 10 hits a day which is against the Ts and Cs because Web servers are prone to DDoS attacks. Anyway, the terms of service look OK for the price. Connecting to lg.loveservers.com (lg.loveservers.com)|2a06:8ec0:1:4::dead:beef|:80... connected. I also used LoveServers' looking glass to check ping(6) and traceroute(6) from them to vps3 and home. IPv4 looked fine, IPv6 was a bit erratic with ping latency. I expect that's because I'm using a Hurricane Electric (Tunnelbroker.net) tunnel, and wondered if the slow download was also IPv6 related. Connecting to lg.loveservers.com (lg.loveservers.com)|185.55.77.93|:80... connected. Yep, native IPv4 gets 168—180 Mb/s whilst 6in4 IPv6 from HE gets 25–35 Mb/s (a sample size of two for each in a single 15 minute window). Ordering and registering was rather simple (only snag: my iNum was deemed an invalid phone number) and I soon received 6 e-mails: Customer Invoice, Order Confirmation, Welcome, New Server Information, Credit Card Payment Confirmation, Your LoveServers ltd receipt [#xxxx-xxxx]. The Welcome e-mail says how to login to the client area, and the New Server Information e-mail contained everything else I needed. The SolusVM login details was my second point of call as I saw very few options in the client area. From here all the typical KVM options are available including reinstalling using their image and booting from an ISO of my own. I am just going to go with LoveServer's image of Ubuntu 14.04 LTS I chose during ordering rather than install from fresh. I changed the timezone to UTC. This new VPS has been given the unimaginative name vps4. Over on vps3 I added the DNS A/AAAA/SPF records for vps4 using the IPv4 and IPv6 addresses vps4 got allocated. Although I'm not currently planning on using vps4 for outgoing e-mail, I wanted to double-check there wouldn't be any future issues with DNSBLs. I pasted the IPv4 address into 2 DNSBL checkers/lookup tools and hit the submit buttons. I was glad to see that the IP address is not listed in a single DNSBL. I then logged in to vps4 as root over SSH. Login as new user over SSH. Disable root password login everywhere. After opening /etc/apt/sources.list in nano and changing all of the URLs from http://us.… to http://gb.… I saved and exited nano. Open /etc/default/grub and change GRUB_HIDDEN_TIMEOUT from 0 to 10, and GRUB_TIMEOUT from 10 to 0. Choose None of the above, and then choose UTC. From VPS3, copy my authorized_keys file to vps4. Back on VPS4, create a symbolic link from my home folder to my ssh folder, and then disable SSH password authentication. After all this time I am still waiting for Esgob to make an AXFR. From laptop, connect to vps4 again and check I can still sudo su root. Disconnect again. The L means that the password for the account is "locked". In other words, the password is set to an invalid value and using it (e.g. to login) is impossible. Ubuntu 14.04 comes with ntpdate, which only checks for drift in the time when the network interface comes up. On a server that is typically only after a reboot. I will be installing openntpd using British NTP servers. LoveServers are having recurrent network issues at the moment. VPS4 ping graph for 20th April 2016 showing 100% packet loss for an hour. It appears that the outage was caused by our datacenter disabling our uplink port due to a port security bug on their cisco switch upstream from us. As this isn't the first time this has happened, discussions will now begin in regards of staying at this facility or not. As this won't be my primary VPS—I haven't worked out how I'm going to utilise both of my VPSs yet—the outage wasn't a major issue. It was nice to see that I get e-mail notifications of known issues as I do with OpenITC. Although LoveServers are young, going by OpenITC and XenVZ's WHOIS records I got my first VPS with OpenITC/XenVZ.co.uk when they were younger than LoveServers are now (7 months old versus 11 months old). I can't remember exactly, but I do recall at some point I was warned that the server containing my VPS was being physically moved to a different data centre. Our supplier has scheduled a move of our server openvz02.xenvz.co.uk to their new facility. The network capacity is considerably enhanced over the current site we are in. VPS Node openvz02.xenvz.co.uk will be moving on 10/08/2009. The move will occur during a window from 22:00 on 10/08/2009 and 05:00 on 11/08/2009. All VPS and the server will be powered down, packaged and transported to the new facility. During the move our supplier takes responsibility for the safety of our equipment but our insurance does not cover data loss or consequential losses – so we recommend you take backups of your data as a precaution. At their new site our server will be re-racked into a pre-prepared environment and checks made by their technicians that connectivity is restored. I have no problem with a server move as long as I am given advance notice and the downtime isn't very long (< 12–24 hours depending on distance being moved). OpenITC gave me 7 days notice of the server being physically moved. They also gave me 10 days notice when that VPS moved hardware nodes within a data centre. It is a bit hard for someone to determine if packet loss on vps4 is caused by me rebooting the VPS or an issue with an upstream provider, as (unlike for vps3) I am not yet tweeting about reboots and stuff. Part of the reason why I went with LoveServers, however, was because the VPS would be located in Manchester. Manchester is the approximate centre of the UK in terms of Internet 'backbone' connectivity and population density, as can be seen in this picture from Wikimedia. In terms of latency (rather than bandwidth usage) geography has a part to play. A lot of people live in South-East England (including myself) so Maidenhead or somewhere else close to (or within) London makes sense for a first location. London is also a good place for UK-Wide and worldwide connectivity due to so many peers at the LINX Internet exchange. 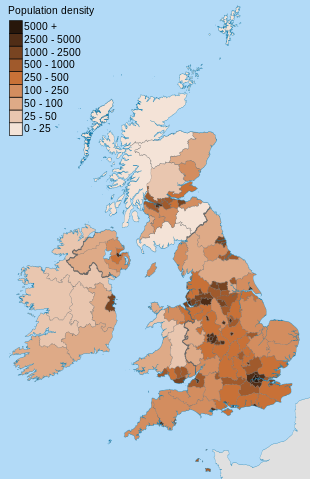 Anyway, as you can see in the population map, after London you have Manchester. After Manchester you have Glasgow/Edinburgh, and then after that you have Birmingham followed by Newcastle upon Tyne, Cardiff, and Belfast. Wikipedia's list of IXs lists 9 in the UK. 3 of those are in London (LINX, LONAP, NetIX), 2 in Manchester (IXManchester, mcix), and 1 in each of Brighton (IX Brighton), Cardiff (IXCardiff), Edinburgh (IXScotland), and Leeds (IXLeeds). By going by population and connectivity (closeness to well-peered IXs) it is possible to work out where a failover server should be located. Almost all ISPs peer at LINX, to the point some traceroutes from Newcastle to Manchester will travel via LINX. If there is a routing issue at an ISP (which invariably in the UK is an issue with a peer at LINX), then Manchester is a good choice of secondary location. Some ISPs (e.g. Virgin Media) peer at IXManchester meaning if the VPS provider's IP range is announced by a peer at IXManchester traffic between ISP users and that VPS will not travel via LINX… if they peer with each other and traffic is routed via IXManchester. Well, that is the theory. The reason that traceroute went through LINX (195.66.238.78) could either be because LoveServers aren't peering with Virgin Media at IXManchester, or because going via LINX was the preferred/shortest route at the time. According to Hurricane Electric, LoveServers' IP range is announced by UKFast (AS34934). The only IPv4 prefix announced by LoveServers themselves is 185.145.44.0/24 and they only peer with M247 Limited (AS9009). UKFast recently changed their peering at IXManchester so that they only privately peer with a small number of ISPs. We've been trying to persuade them to be a little less picky. According to LINX, UKFast have an open peering policy (an inclination to peer with anyone) and Virgin Media have a restrictive peering policy (an inclination not to peer with any more entities). Virgin Media have a 10G port on router 195.66.244.33 at IXManchester and UKFast have a 1G port on router 195.66.244.25 (IPv6: 2001:7f8:4:2::8876:1) at IXManchester. Something worth noting is that vps4 has so far always had quicker ping response (round trip) times than vps3, even though the speed of light should mean that isn't the case. From here to Telehouse North is approximately 25 miles. Telehouse North to Maidenhead is approximately 40 miles. Telehouse North to Manchester is approximately 225 miles. Therefore an as-the-crow-flies distance (one direction) from home to vps3 via Docklands is approximately 65 miles and from home to vps4 via Docklands approximately 250 miles. It should take data longer to travel 500 miles than it does to travel 130 miles, but that isn't the case here. The Maidenhead to London to Manchester fibre must be pretty good. 530 miles round trip in less than 8 milliseconds. Assuming data travels at 60% of the speed of light in fibre, it can travel 894 miles in 8 milliseconds. Put another way, 4.74 milliseconds is currently the fastest data can travel 530 miles, and that 530 miles assumes it is a straight line from vps3 to Docklands and another straight line from Docklands to vps4 (rather unlikely). Given VPS4 has better round trip times than VPS3 for someone only 21 miles as-the-crow-flies from Telehouse North, traffic from Newcastle (or anywhere else in the UK) to my VPS in Manchester will probably have the same latency as it would going to my VPS in Maidenhead if it goes via LINX. Therefore although LINX may be a problem at times, until UKFast peers with more UK ISPs at IXManchester I can treat vps3 and vps4 as if they are at the same location if I decide to do anything like geographical DNS. I have commented some lines #'# to indicate they have been copied from vps3 where they are active, to differentiate from rules that are also disabled on vps3. #-A OUTPUT -o eth0 -d  fc00::/7 -j LOG --log-prefix "eth0 block ula"
At this point Ubuntu 16.04 was released. New release '16.04 LTS' available. The -c switch checks if an upgrade is available and tells you what that upgrade is without upgrading to it. The -d switch checks if a development version is available to be upgraded to and then upgrades you to it. The value of Prompt in /etc/update-manager/release-upgrades determines what upgrades will be available. If Prompt=lts then only upgrades to LTS versions will be performed. Before continuing, modify iptables and ip6tables rules so that syn packets to port 1022 is let through. Then press y and hit enter. Once the upgrade is complete and the system has rebooted, make the same changes I made earlier to those files, update grub, and reboot. Comment out the lines in iptables.save and ip6tables.save and run iptables-restore and ip6tables-restore. This section is based on my previous article Using NSD as My Master Nameserver and Digital Ocean's How To Use NSD, an Authoritative-Only DNS Server, on Ubuntu 14.04. I use the latest version of NSD as an authoritative name server. Add the new IPv6 address under the /64 subnet line. # Remote control config section. ExecStartPre=/bin/sh -c '/bin/chown "$(/usr/local/sbin/nsd-checkconf -o username $CONFFILE)" "$(dirname "
To use TSIG to make sure no MITM is messing with the AXFR requests/responses, a shared key needs to be generated. I'll do this on my laptop as it has a lot of entropy. Now just change NOKEY to vps3key on vps4 for allow-notify and request-xfrin pattern vps3master, and on vps3 in pattern myzones. Things on my new VPS aren't anywhere near setup yet and there is still a lot to do. One thing that can get annoying, however, is an unexpected fsck during a server reboot. Login to SolusVM, and then click VNC. Click connect and then enter password from SolusVM. Posted by John Cook on Monday, 29th February 2016 .